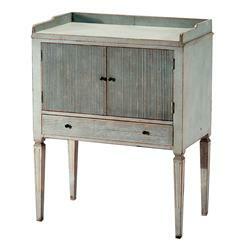 This spindle leg side table has so much vintage charm working, it could fit into a variety of spaces and styles. French country is a shoe-in, though with the distressed paint and washboard effect veneer on the drawers and doors it also delivers a strong 1930s vintage feeling. We could see this in a cute kitchen, feminine bedroom, or even doing time as keeper of modems and other modern devices in a home office.